An evening of fun & learning! 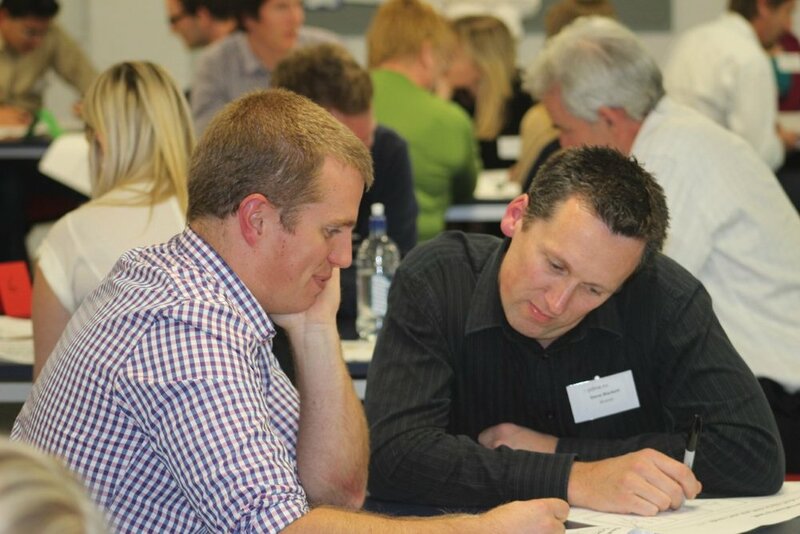 If we were to describe the recent PDMA event in a few words I would say – fun, interactive and hands-on. 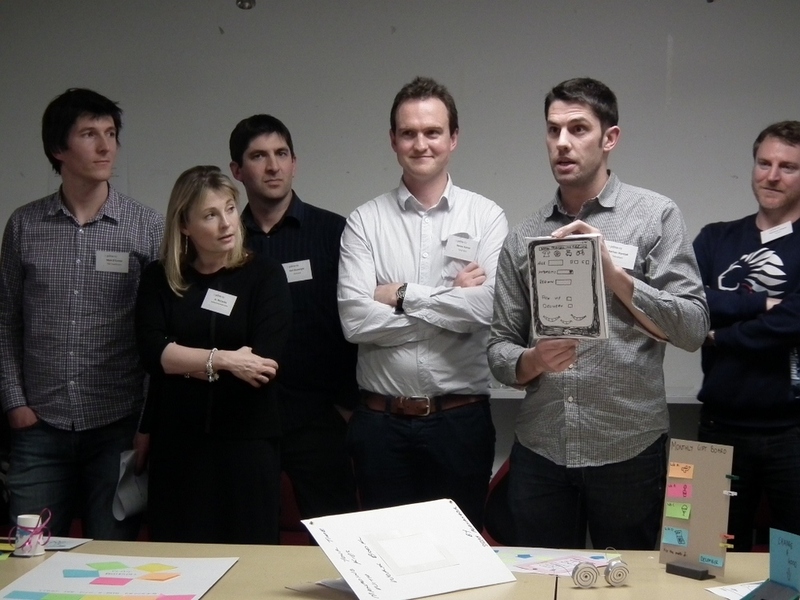 This is the Design-Thinking workshop run in conjunction with John Hatrick-Smith (of New Zealand Trade & Enterprise’s Better by Design programme) (of New Zealand Trade & Enterprise). 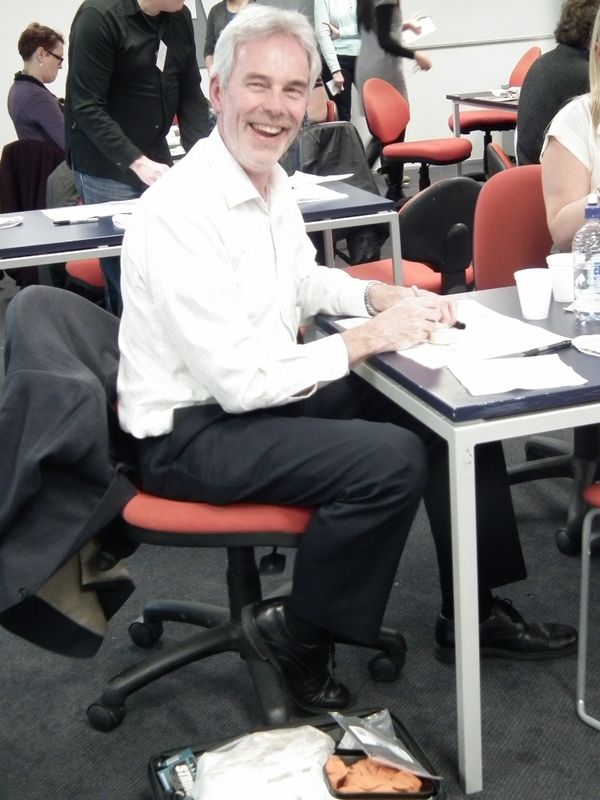 John Hatrick-Smith (BBD) facilitated this workshop, supported by a team of PDMA’s new facilitators who were “trained” the previous week. 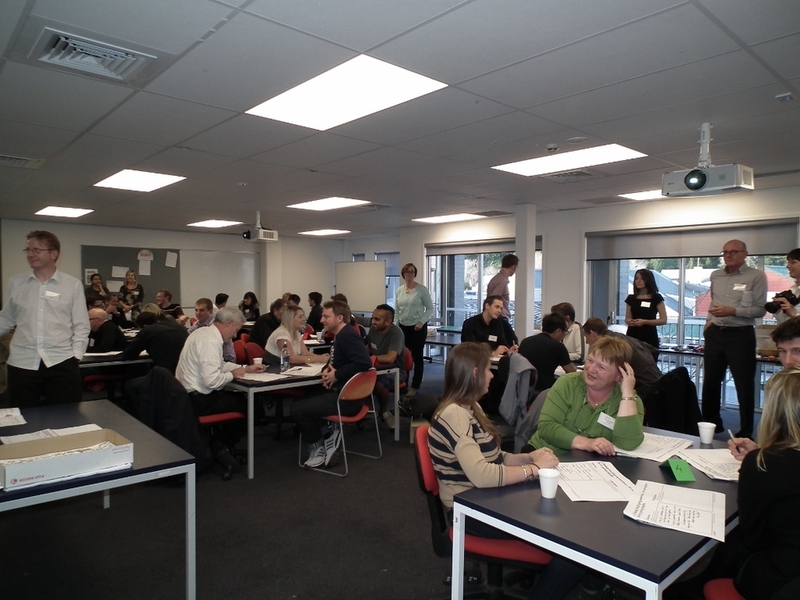 Massey University’s design school at Albany was the venue for this activity-based workshop, which was attended by around 50 participants from various industries. We had attendees from Air NZ, F&P Appliances and Healthcare, Southern Cross Healthcare, Simcro and many more companies...and even Harraways in the South! We had senior students, executives, educators, practitioners and government representatives, all in one room working through the entire design process in 1 hour! 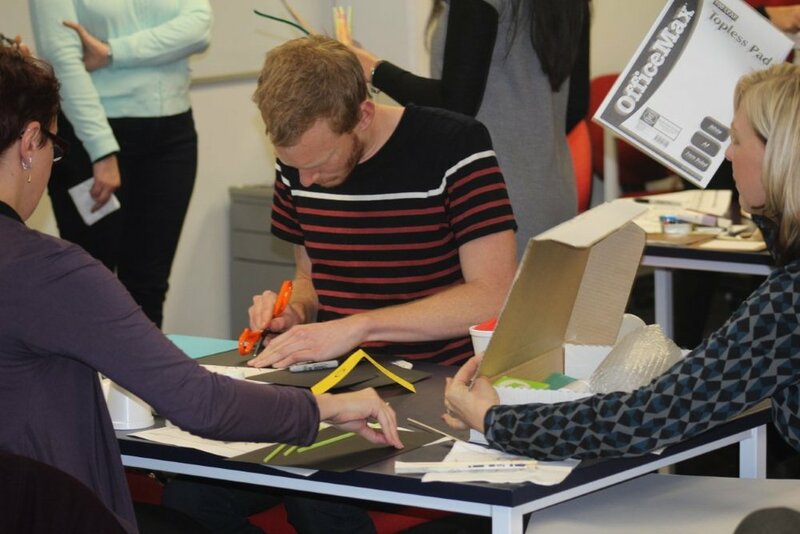 To embed design & innovative thinking across disciplines, across departments and businesses. Traditional companies need to change fundamentally how they operate in order to gain benefits of this approach. To get out of offices and R&D labs and out into the real world where conversations with real users can be had. To use these conversations with customers to dive into their latent needs and emotions. To observe people and gain insights into problems and opportunities that may not be articulated yet. Use simple modelling methods early in the process, often using simple materials to convey your idea and gain quick feedback. The method offers people a customer-focussed approach and a creative edge. It includes the ‘diamond’ shaped divergent and convergent thinking styles and takes you through iterative cycles of design rapidly. The engaging one-hour workshop is one of the tried-and tested methods developed at the Institute of Design, Stanford, USA. In order to innovate successfully, one needs to get out of working in “silos”, and be comfortable interacting with people outside your own discipline. 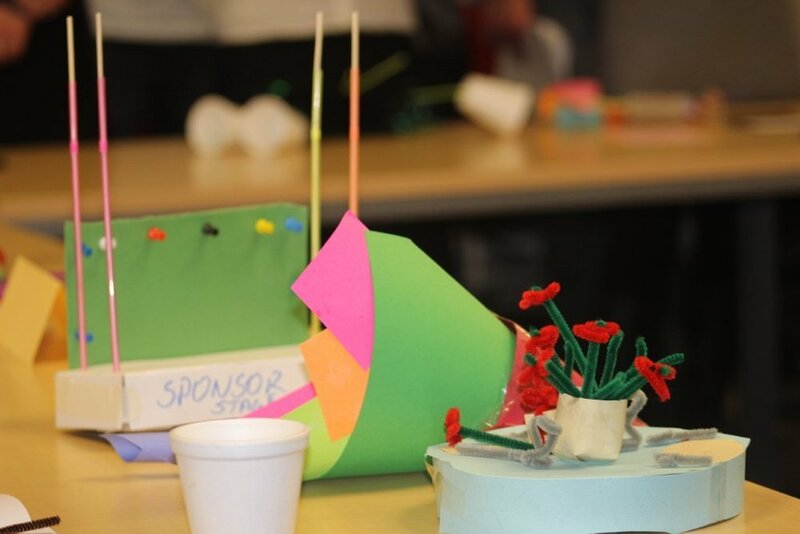 In the one hour we had many creative solutions, we even had innovative new business opportunities for florists! These sessions have the power to generate patentable ideas, and radically new concepts. This kind of empathetic connection with consumers is increasingly the key to opening up new business opportunities. It has been said that “every business should be prepared for someone outside their company coming up with a better solution, taking all their customers and making their company redundant!” So, be prepared....and learn how you can be better by design. Actually getting stuck in and learning a design tool! I think the group discussion was really great, all in all a great event. Brilliant, how it revealed the emotional motivations before the rational usual approaches. I really enjoyed it, excellent work. I also liked that we had an opportunity to work through the process as we went so that it wasn’t just a lecture about the thinking process – we got to experience it. There’s nothing I can think of that would have made this event better. Compliments to the organising committee. Doing a fantastic job. Overall the event was really well run and managed, it exceeded expectations. Workshops stretch the mind and site visits always give interesting info and perspectives. Well run, well organised, easy parking, overall a great success. Pat yourself on the back.